Previous winners include Denzel Washington, Jodie Foster and Walt Disney. In 1982 Sir Sidney Poitier received the Cecil B. DeMille Award but tonight at the 75th G9lden Globes, actress, producer, and philanthropist Oprah Winfrey became the first black woman to be given this same award. 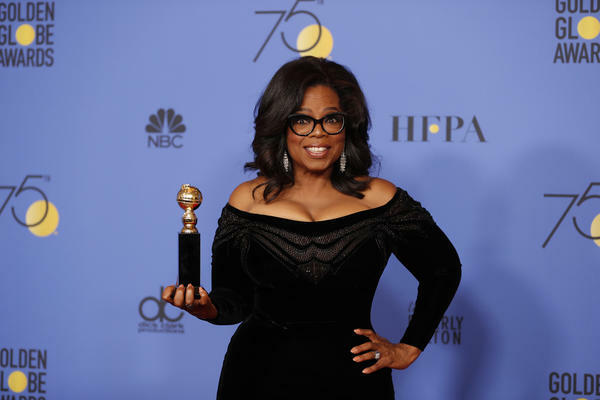 The significance of the accolade, a lifetime achievement award, given by the Hollywood Foreign Press Association to individuals who have made outstanding contributions to the world of entertainment, was not lost on Winfrey, who called it an honor. Other notable award recipients included Sterling K. Brown who became first black actor to win for leading performance in a TV drama for “This Is Us” and Aziz Ansari who became the first Asian male actor to win best leading performance in a TV comedy. Other nominees of color Mary J. Blige, Anthony Anderson, Octavia Spencer and Daniel Kaluuya failed to garner any accolades. The star of the upcoming “A Wrinkle in Time,” Winfrey joins Bing Crosby, Walt Disney, Judy Garland, Bob Hope, Morgan Freeman, Warren Beatty, Denzel Washington and Jodie Foster who are all some of the many recipients of the Cecil B. DeMille Award in the 75 years since the Globe started. The Golden Globe Awards are viewed in more than 236 countries worldwide and are one of the few awards ceremonies to include both motion picture and television achievements.